Today I whipped-up a very simple tool for ConfigMgr admins and support staff. 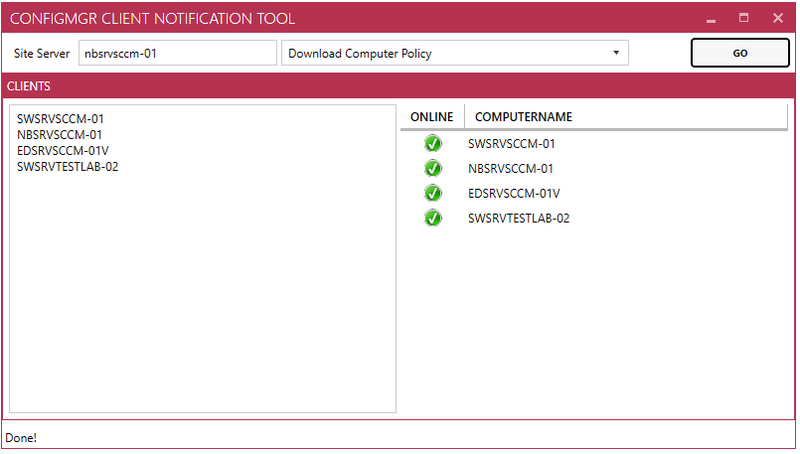 It allows you to send client notifications (using the so-called fast channel), such as downloading the computer policy, collecting hardware inventory, checking compliance etc, to remote computers from your local workstation independently of the ConfigMgr console. The tool connects to your ConfigMgr site server using a Cimsession and PSSession, so you need WsMan operational in your environment. You simply provide some computer name/s in the text box, enter your site server name, select which client notification you want to send and click GO. The tool will get the online status of the clients from the SMS Provider to give you an indication of which systems will receive the client notification. Then it will trigger the client notification on online systems from the site server. The tool is coded in PowerShell / Xaml and uses the MahApps Metro libraries for WPF styling. I decided not to package the tool this time but just to release the files as they are, so if you need to tweak something for it to work in your environment, such as a non-default WsMan port, you can do that. Download and extract the zip file, right-click the ‘ConfigMgr Client Notification Tool.ps1’ and run with PowerShell. Feel free to leave any feedback.